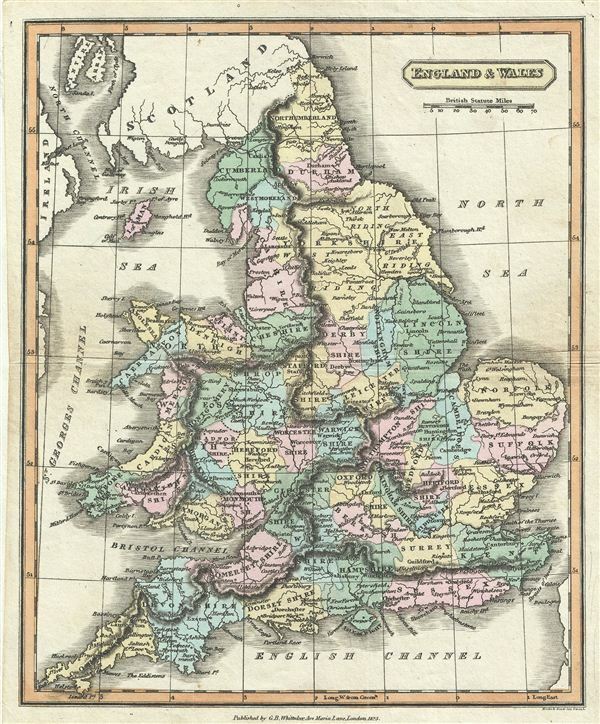 This is a fine example of G. B. Whittaker's 1825 map of england and Wales. The map covers both england and Wales from Northumberland to Cornwall and includes the Isle of Man. At this time in history, the Kingdom of Great Britain and the Kingdom of Ireland had been consolidated into a single political entity. Map is color coded according to territorial boundaries. Various rivers, owns, cities, mountains and several other topographical features are marked with relief shown by hachure. This map was published by G. B. Whittaker of Ave Maria Lane, London in 1825. Very good. Blank on verso. Typical wear over original centerfold.